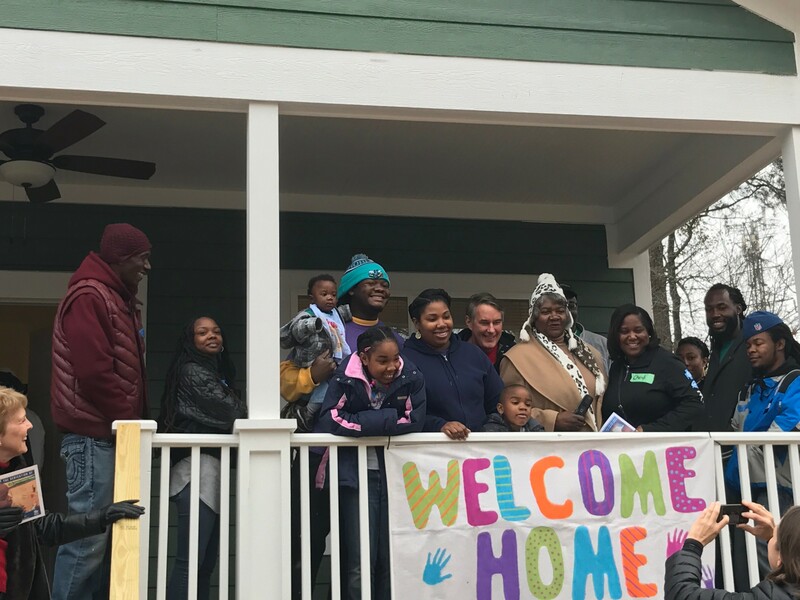 On December 17th, the Jones family walked into their new house. They were greeted by more than forty people – family, friends, neighbors, and, the partners that helped to build their home. In a few weeks, the family will move in and start to build a life on Alma Street in Durham. They’ll build relationships, foster a community, and create memories to last a lifetime with their family, friends, and neighbors. 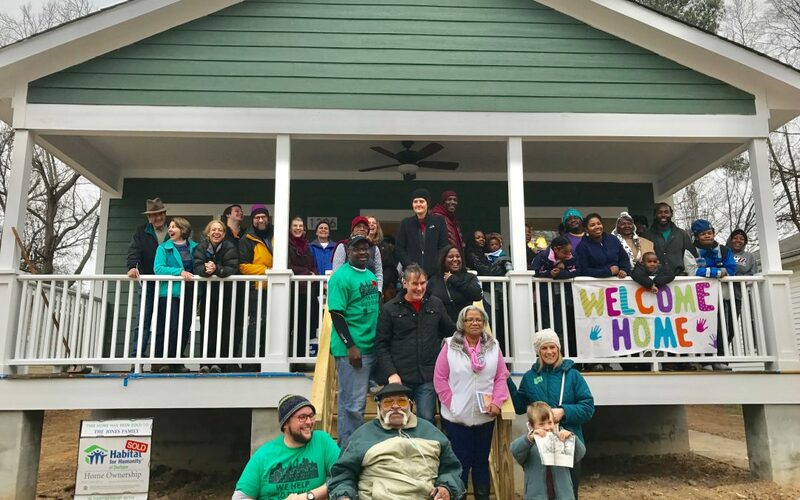 The Jones’ house is just one of twenty-six that were built in partnership with Habitat for Humanity of Durham during 2016. In 2017, this organization plans to build thirty-five houses. And the year after that, fifty, maybe even 100 houses! The excitement that Habitat for Humanity of Durham brings is contagious. The premise is simple – building affordable homes equals a safe, reliable shelter for a family in need. It doesn’t take a construction license or an engineering degree to solve that equation. And it’s easy to see that the end result fulfills a basic need that we all should have access to. But Habitat for Humanity of Durham is more than fulfilling basic needs. It’s about partnership. Habitat for Humanity International was founded in 1976. In 1985 Habitat for Humanity of Durham officially kicked off with an inaugural meeting at the First Presbyterian Church in Durham. For nearly thirty years, it has been building homes and changing the lives of those in our hometown. To date, the organization has changed thousands of lives by building more than 350 homes. And, Executive Director Blake Strayhorn says that there’s still so much more to do. “We’re working for Durham, in Durham, for the communities and citizens of Durham. We’re partnering to build homes and change lives,” Blake said at the house dedication. And that’s why he’s shooting for more homes to be built year after year – twenty-five, thirty-five, fifty, even 100 houses. A lot of work goes into building a home, and a lot of help goes into that work. Habitat partners with a host of people to make dreams come true. Families work with Habitat to find a safe, low-cost, well-built home. Contrary to popular belief, the houses are not “given” to the homeowners. The homeowners must work on the house for a specific number of hours, and additionally, they must pay a monthly mortgage. This partnership between the homeowner and Habitat is one of the relationships that gets the entire process going. Habitat also partners with organizations and corporate sponsors to build the homes. Each of the organizations and corporate sponsors join as volunteers to put nails to boards and get these homes raised. Like the partnership with the homeowner, Habitat also works with the City of Durham and its employees to make sure the end process comes to life. It’s a true community effort. And at Blue Cross Blue Shield of North Carolina, we’re proud to be a part of this community. Construction on the nearly-finished home started in the parking lot of BCBSNC on our Day of Service in August 2016. On that day, more than 1,000 employees came together to serve the city that we call home. And just as we take pride in giving back to our community, we challenge you to do the same. Find an organization and pitch in. Maybe even volunteer with your local Habitat for Humanity. Partner not just to construct a house, but to build a home.